Few graduate schools in the U.S. teach Old Norse, an ancient language with Germanic origins, and fewer liberal arts colleges offer it still. 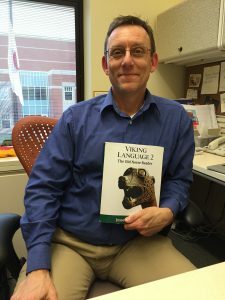 But this past academic year, Dr. Lee Forester brought the language of Vikings and Icelanders and even Tolkien fans to a Hope classroom, using modern techniques to teach age-old, runic vocabulary and grammar. At first, Forester, a professor of German who also studied Old Norse during his graduate school days, decided to offer the new yearlong course for personal reasons – his son, who is enrolled at Hope, was interested. “But his interest made me realize others could want this class, too,” the professor says. Sure enough, others did. At total of fourteen students enrolled in this first-time offering, receiving elective credit. Most of the students had some German background and many, it turned out, were J.R.R. Tolkien fans. What does the lord of The Lord of the Rings have to do with Old Norse? 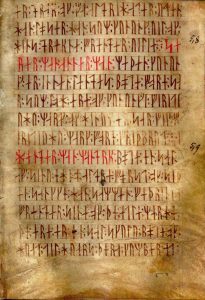 “Old Norse has an older stage of its writing system that pre-dates Latin called runes,” explains Forester. “Runes are a form of writing carved in stone or wood, using mostly straight lines because it was much easier to carve those as opposed to circles or curves. These are found all over Sweden and Norway. Creating this new class – offered as German 295 – was no small task and became a true labor of love for Forester. Finding a current, modern textbook was his first challenge. Few are in print. He quickly ruled out one that dated back to 1850 and found the only text he deemed suitable, The Viking Language Series, by Jesse Byock, a Scandinavian scholar and archeologist from UCLA. Teaching grammar first and then vocabulary later, Forester got both creative and resourceful in his lesson-planning and instruction. He used Quizlet, a website that combines technology and language instruction, to test students on 28 Old Norse word lists. Then he hired a tutor from Iceland who lives in Denmark – Thor Jōhannsson – to speak and record those words so students could hear an authentic pronunciation as they read along. For added instructional help, Forester and his students also uploaded pictures alongside each Old Norse word to give visual support while Thor gave aural accuracy. Then, an added affirmation of Forester’s teaching came from out of the blue when Byock, the text author, contacted Forester unsolicited. Byock had found the Hope prof’s Quizlet pages online and thought they were outstanding. Now Byock is using them for his classes at UCLA. Forester hopes to offer Old Norse again but will take a year off. While he and his students enjoyed the new work (though he termed it “the hardest language some will ever encounter but they were up for the challenge”), he says he’ll wait for a new crop of interested students to grow large enough for a full class. With the popularity of Vikings history, Icelandic tourism, and, of course, all things Tolkien, it most likely won’t take long to fill another Old Norse class, when next time he’ll weave more old Nordic and Icelandic culture into his lessons. So for now, it’s not vertu blessaður (goodbye); it’s þar til næst (until next time).